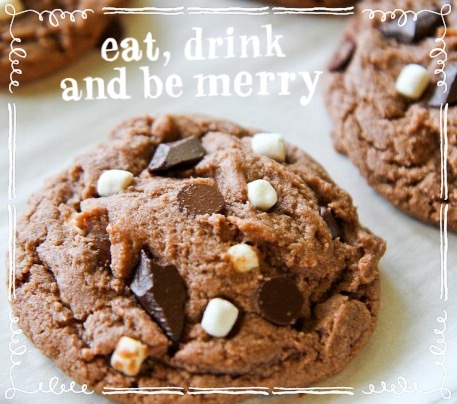 This cookie is truly like enjoying a cup of hot cocoa. I enjoy making these all year long but the winter time is my favorite, a cup of hot chocolate and one of these cookies feels like pure pampering add in a good book 📚 and like is good! A book, hot chocolate, and these cookies in a gift bag is a perfect Christmas gift. You might want to add this as a must make for the holidays. Cream together your butter and both sugars until light and fluffy. Add in eggs and vanilla and blend well. In a separate bowl, mix together flour, salt, baking powder, baking soda, and hot chocolate packets. Add the dry ingredients a little at a time to your wet ingredients. Stir in chocolate chips and marshmallow bits. Drop by rounded teaspoons full on to greased cookie sheet. The dough can be on the dry side but these bake up delicious, so no worries. Bake at 350 for 8-11 minutes. Let cool for about 5-10 minutes.